How is the hospitality industry doing these days? 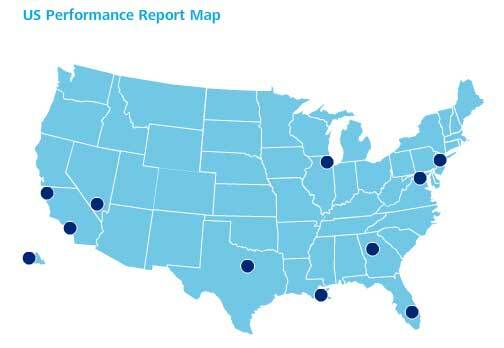 The blue dots in this map from Deloitte shows the areas of the US where the market is picking up. For instance, the hospitality industry in Chicago continues to emerge from the recession; in fact, economic indicators and industry data appear to suggest continual, albeit mild, improvement in the market. Or Las Vegas, which remains one of the largest hospitality markets in the world attracting both leisure and business travelers. In fact, the tourism industry continues to show signs of a steady recovery, as the city welcomed 39 million visitors in 2011 (up from 37.3 million in 2010). My passion is our wonderful food service industry. I was born and raised in Chicago, one of the best restaurant cities in the world. Every job I have had in my life has been in the foodservice and related industries. I was educated at the finest culinary school in the United States, The Culinary Institute of America (1975) in Hyde Park, New York. That education enabled me to seek out my dreams. I have been an executive chef of several fine restaurants and clubs, owned many restaurants and now, my ultimate passion is design, consulting and writing. I presently am the owner and lead designer at National Restaurant Design (http://nationalrd.com). We specialize in foodservice design and concept creation. What I love most is to help clients develop concepts responsibly so that they may realize their vision. I love helping people like myself who have the restaurant bug, open their restaurant on budget in the most efficient space possible. Now an author of How to Open a Restaurant, Due Diligence, I want to help those who seek out foodservice ownership to do their due diligence as early as possible in the process. It is the major difference between success and failure. How To Start A Restaurant, resources and guides. What Kind of Restaurant Would you Like to Own?